This simple, inexpensive mission-style bookcase features only 2 shelves but will be a great mission accent piece. Click here for detailed mission bookcase plans. 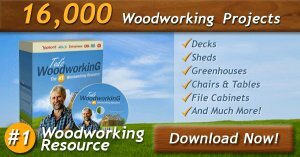 The material should be either oak or chestnut, which can be secured from the planing mill dressed and sandpapered ready to cut the tenons and mortises. 2 ends, 7/8 in. by 10 in. by 31 in., S-2-S.
1 shelf, 7/8 in. by 10 in. by 35 in., S-1-S.
2 trough pieces, 7/8 in. by 4 in. by 35 in., S-2-S.
8 keys, 5/8 in. by 5/8 in. by 3 in. The two end pieces should be made first with the top corners rounded off and the lower end, which is of simple design, can be cut out with a bracket saw  and smoothed with a wood rasp. The mortises should then be laid out according to the sketch and cut, by first boring 3/4-in. holes and finishing with a chisel, being careful to keep all edges clean and free from slivers. 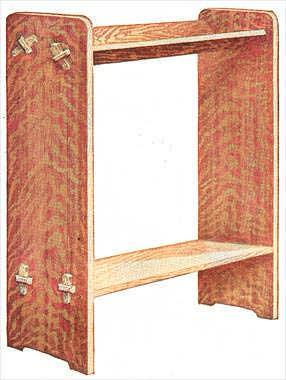 The shelf can now be made by cutting a double-key tenon at each end to fit the end pieces. The space between the two tenons at each end can be cut out with a bracket saw and finished with a rasp. The key holes should be mortised as shown in the sketch. The bookcase pieces are made in a similar manner, care being taken to have all tenons and mortises perfectly square and a good fit, so the bookcase when assembled will have a neat and workmanlike appearance. Finish the bookcase by staining.